Close to the ruins of Rievaulx Abbey, this traditional cottage with exposed stonework and open fire, has superb views. 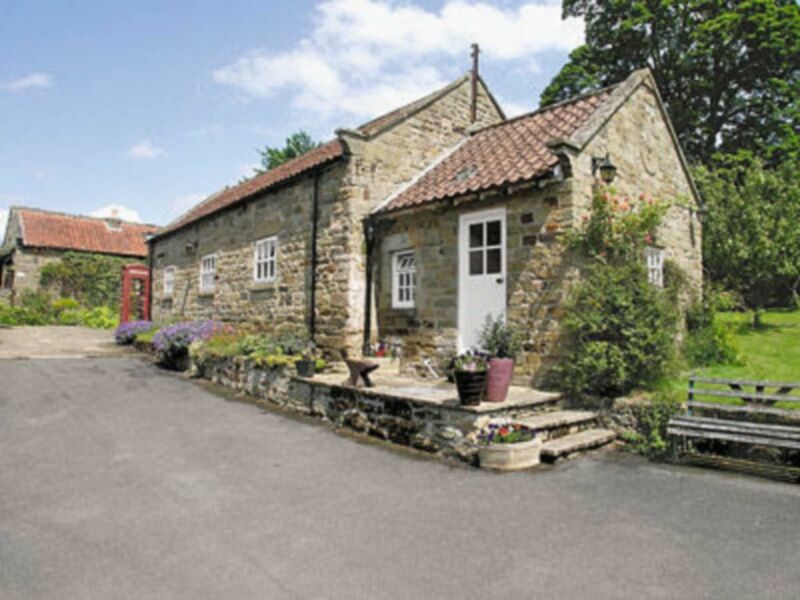 Within the North York Moors National Park, in a sheltered wooded valley close to the magnificent ruins of Rievaulx Abbey, these spacious, comfortable and well equipped holiday cottages stand in a landscaped courtyard, close to the owners’ farmhouse. Guests can enjoy farmhouse breakfasts in the conservatory at Laskill Grange, while across the drive at Laskill Country House, the owners’ daughter offers home cooked evening meals or ready prepared frozen meals to enjoy in the comfort of your holiday cottage. Bridge Cottage and The Coach House have an interconnecting door and may be booked together to sleep 6. Visitors can wander the 70 acres of beautifully tended grounds or relax in the shared terrace garden with its small lake and river frontage. The views over the surrounding countryside are superb, and there is excellent walking from the doorstep. Long distance footpaths along this area’s Heritage Coastline, and the Cleveland Way, offer perfect terrain for walkers and cyclists. The Ryedale Folk Museum at popular Hutton-Le-Hole, and the ruins of Rosedale Abbey are both worth a visit. For a day out, the North York Moors Railway runs steam train journeys between Grosmont and Pickering. Whitby, is easily reached, with miles of sandy beaches and an ancient abbey overlooking its harbour. Scarborough, and the coastal villages of Staithes, Runswick Bay and Sandsend are all within 20 miles. Horse racing at Thirsk, Wetherby and York, 25 miles. Closer to home, Helmsley has Duncombe Park and a castle. Shop and pub 2 miles. Living area: With TV, DVD player, CD player and beam. Bedroom 1: With double bed and 3 steps to en-suite with shower cubicle and toilet. All properties: Oil central heating (£25 per week, £15 per short break November-March), electricity, bed linen and towels included. Cot and highchair. Payphone (shared with other properties on-site). Freezer (shared with other properties on-site). Patio areas with barbecue. Conservatory with communal Wi-Fi access, terraced garden and 70-acre grounds (shared with other properties on-site). Hot tub (shared with other properties on-site). Private parking. No smoking. Please note: These properties have a natural water supply from a spring and there is a small lake and river frontage within the garden. ADDITIONAL INFORMATION for all properties at Laskill Grange - There is a private water supply to the property and the freezer is shared with other cottages on the site. There is a small lake and river frontage within the garden. Offers Wi-Fi, this facility cannot be guaranteed to be available at all times due to the unpredictability of Service Providers. There is a designated area in the conservatory of the main house which is for guest. Password available ininformation folder. ADDITIONAL CHARGES for all properties at Laskill Grange - There is a fuel supplement from October to the end of March of £25 per week and £15 per short break, this is payable on arrival.